Clearly, I'm not even bothering to get the dates right this time. It just so happens I kind of had a trip planned for the sort of middle of the month so I took the opportunity. 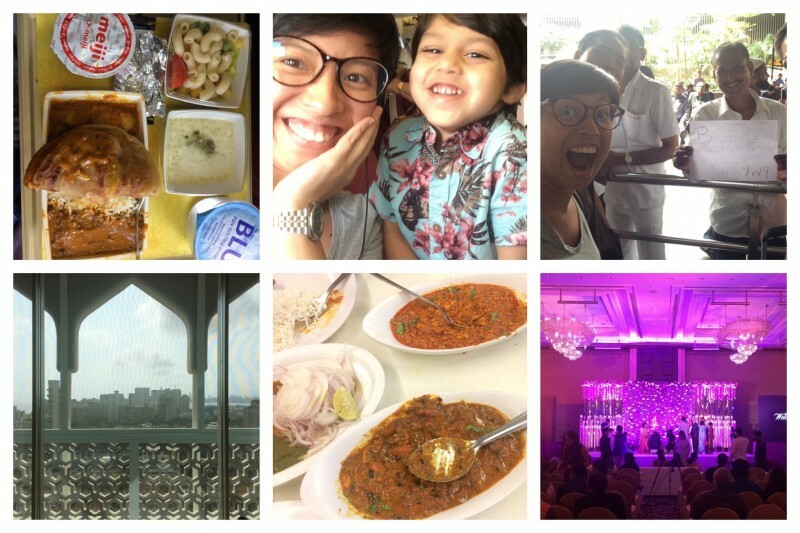 It would have been a waste to not share with you my first time/trip in Mumbai so why not? There are absolutely no photos from the 12th here. It's an absolute lie/cheat. I've resorted to complete and absolute cheating now. Take 12 photos on the 12th of each month Cheating~ I know! I am in love with Indian food and only from this preview of the amazing, non-spicy food that they serve me on the flight. EVERYTHING is absolultely delicious and had I am not prepared for this onslaught of awesome. I've also made a new friend. This little boy was very very friendly. He asked me to play with his 'helicopter like thing that you put on your fingers' (which is the Google search keyword I plugged in) to find out that it was a Fidget Spinner. I still don't understand the point of this but he was cute (and asleep for the most part). I've never been picked up at the airport by someone with a sign. It was worth taking his photo. Also, I was expecting horrific traffic in Mumbai but Jakarta and Manila have desensitised me/totally messed up what I consider to be traffic so my relative knowledge of traffic jams is now messed up. The idiot in me thought that because the hotel's name was Taj Mahal, I would see the Taj Mahal. Obviously, I did no research on this trip. If I had done any research at all, I would have known that I would need to take a 6+ hour flight to see the Taj Mahal. So this is my view instead. Not bad either. Also because we did not research, I wasn't sure where it was good to eat. And though I'm pretty brave in venturing out by myself, I have to admit i was still pretty nervous to do it by myself in Mumbai. So luckily, a male colleague came along and we found pretty good butter chicken! I will never be sick of butter chicken of the non-spicy variety. And it's Sangeet time! I've been rehearsing for my brother's own Sangeet (that was scheduled for the literal next Friday) but I definitely wasn't prepared for the scale of this Sangeet complete with both families preparing 7-10 dances each. It was a spectacle. I felt like I was in a Filipino-noontime-show audience. Production value on point and all. Oh look! I made it to day 2! Except I woke up extra late and had to scavenge for breakfast. We also had to shop really quickly at Fab India for traditional ish clothes cause all we had left were Western clothes. So here I am rocking my not so traditional but made in India dress with the band. What band, you say? Why the band that would play obnoxiously loud music as we danced along the street for a street parade with my colleague, Sagar (also known as the groom) sitting on a white horse as we escorted him to meet his beloved, Neha who we then met an hour later. It was a really short walk that had SO MUCH DANCING. My feet gave up and I changed into sneakers. So this is the ballroom that greeted us when we got back. It was pretty insane. The amount of real flowers and decoration that hotel ballroom had is nothing compared to anything I've seen and I've been to my share of weddings. 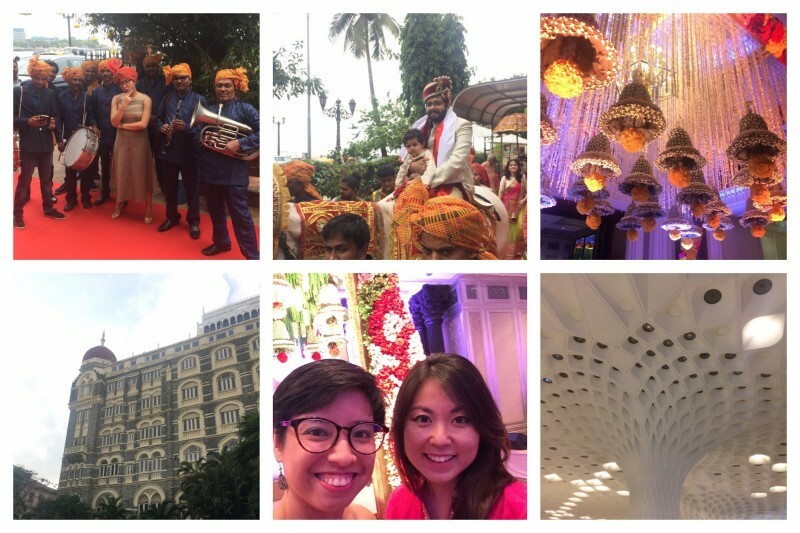 Indian weddings are like normal weddings on steroids. It was amazing. And because I wanted to nap, I decided to actually go and have a look around this very swanky hotel that I would never have chosen to stay in had it not been all paid for by Sagar's super generous father. This hotel is sick! It's so pretty and I've never stayed at a hotel of this calibre either. Basically, this trip was a trip of firsts. Funny story on how small the world is. After posting a photo of myself with the band, my friend Ami messaged about how she too was in Mumbai. I asked what hotel she was at and she mentioned she was staying with a friend and that was that. Lo and behold, I walk into the ballroom for the dinner (when I say ballroom, I mean the ENTIRE FLOOR MEANING ALL BALLROOMS WERE BOOKED FOR THIS WEDDING), there was Ami! How does she know the groom perchance? Oh she doesn't. She know s a friend of the groom and that is enough to be invited to an Indian wedding. AMAZING. But because I had to be home on Sunday, I had to eat REALLY QUICKLY (oh I ate a LOT in the few minutes I was in that ballroom) and then I was whisked off to the airport where the trip to the airport was way faster (an hour) compared to the time I spent checking in (even if I had only carry on luggage). Oh well. It was a fun weekend.